Learn the basics of scenic design and create your own scale model set. 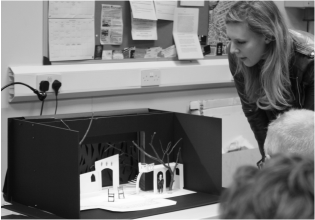 This course, taking place over 4 Sunday afternoons, 1pm - 5pm will give students the opportunity to learn the process of professional set design, and put it into practice . We will cover the whole set design process - how to start, and what you need to know. You will be guided by a professional set designer, and materials will be provided. This course is suitable for anyone who is interested in set design - possibly as a career option - and who wants to know more, e.g. students who are considering applying for set design at uni, and who would like to create work to go in their portfolio, or for teachers who are looking for some cpd skills training in this area, also those involved in amateur theatre, who may want to advance their set design skills to a more professional standard. Anyone who is involved in performing arts or film, and who would like to learn more about this particular area. Or anyone who is just interested in knowing more about this fascinating combination of creativity and technical knowledge. We will cover: An overview of the history of scenic design, and contemporary practice. Working from a simple short text to understand the process of creating a scenic plot. Research and mood board skills, and how to develop ideas. Working to scale and making a scale model to show your ideas. Materials and model making. Drawing a ground plan / technical drawing. Health and safety. You will create your own individual design model box, which you can take away with you at the end of the course. Basic materials will be provided. The course will take place at our Edinburgh HQ, at Beaverhall Studios, Beaverhall Rd EH7. You will need a small basic kit, which consists of a 1:25 scale ruler, a swan morton scalpel blade holder and a packet of blades, a 30cm steel ruler, a small (A4 or A2) cutting mat and a propelling pencil.